Babies mature and change during their first year. They need different toys to develop. Bright colors, moving objects and interesting sounds get the babies attention. A mobile is a great toy to start with. 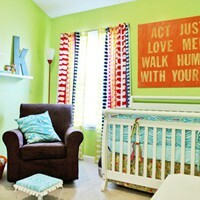 For their room, put bright colored wallpaper and pictures. The sense of touch is important at this time for the baby. Babies need something to touch,feel or taste, Pieces of the toys should be 1 1/2 inches. Toys include teething rings, cups and rattles. Trying toys that squeak or make noise will help the baby produce. Babies still need toys that can be handled, thrown or shake. Finding a toy that makes a sound interests them. Some good toys would be blocks, balls, or large plastic beads. At this time, the baby needs start crawling. If the baby is already walking, you should provide push or pull toys. Baskets and boxes are very useful for the infant. When you choose a toy, always choose a toy that encourages use and participation. As the baby grows up, toys will become more complex. 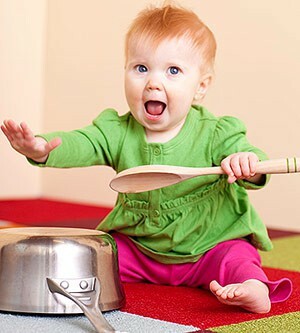 Parents let their kids use common household items like metal pans, plastic buckets, wooden spoons or mixing bowls. When buying a toy, you should always look for toys that remain interesting throughout the babies years. A set of blocks is a great example because the baby will learn how to make different things with the blocks as they get older. Babies often choke on small parts from a toy so it's important to keep them away from the toys that can be hazardous. Common household items can be choked on such as pens, keys, forks etc. These things should be kept away from the baby where they can't reach.